One of the great advantages of staying at NIAS (the Netherlands Institute for Advanced Studies) is that there is ample time for reflection and reading. Yesterday, I actually read a book – from cover to cover I mean. It is a book I have been wanting to read for years, but never got to it because my reading over the years has become what I call “functional reading”. This means that, apart from all of the student and PhD papers I had to read, I have mostly been reading articles that were of direct use to the texts I was writing, sometimes even merely skimming them after having read their introduction and conclusion. Or I was picking out that one chapter of a monograph which seemed most valuable for the paper I was drafting. But yesterday, I had the luxury of reading an actual book, and what a book it is –Benedict Anderson’s Imagined communities. 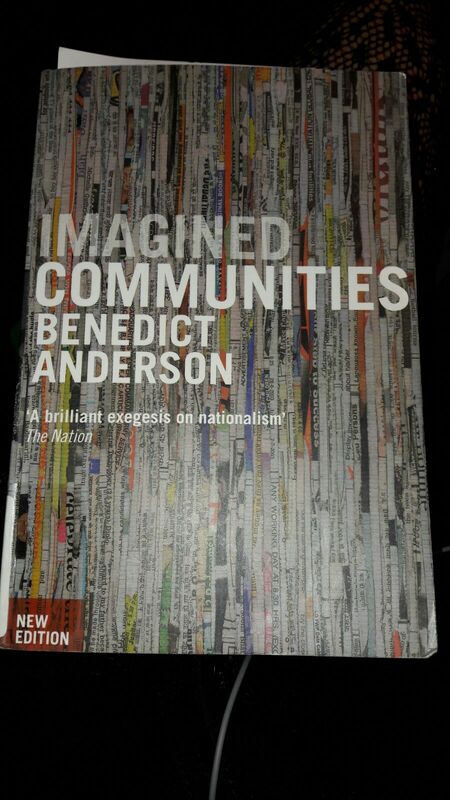 In Anderson’s inspiring analysis of the rise of nationalism, he pays special attention to language. According to Anderson, language – particularly in the form of the printed word –, capitalism, and the emergence of the sense of belonging to a nation, have evolved reciprocally. When book printing first developed in Europe in the late fifteenth century, its main product was the Latin bible. Book production increased from roughly 20 million in 1500 to over 200 million around 1600. Understandably, the market for Latin bibles became saturated, and, also under the influence of Protestantism, vernacular bibles and other texts started to be multiplied by printing workshops that sought new markets for their products (this is the capitalist touch!). 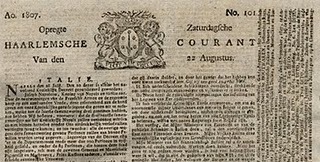 Novels and newspapers became increasingly important among such newly distributed media. Bluntly put, book printing changed perceptions of time (religious scriptures containing a sense of timelessness and continuum, whereas newspapers and novels embodied a notion of progressing time). Moreover, the printed book fixed and uniformed language, because printed mass editions neither allowed for the consecutive small changes in language that had previously occurred in monks’ hand copies, nor for a multiplicity of editions in different dialects. Ultimately, this fixed language also became the language of state government, pertaining to a particular (and eventually non-dynastic) territorial domain, the nation state. Language, according to Anderson, has thus been crucial in the formation of the imagined communities that constituted nations, which in reality of course consisted of many ethnic communities, with their own languages and dialects. A good example is bahasa Indonesia, which the Indonesian state proclaimed as its national language after independence. Interestingly, this language was not the original vernacular of the multi-ethnic inhabitants of the archipelago, but it stemmed from the administrative Malay language (dienst-Maleis, or Maleis) that the Dutch colonial state had mostly employed as the official language for government affairs in the East Indies since the late ninteenth century. This language in turn originated from the lingua franca that had been in use since the early modern period as a means of communication between local traders and European traders and VOC officials in this part of Southeast Asia. For most Javanese, Sundanese or Ambonese people, to mention but a few, bahasa Indonesia was not their first language. Despite some ethnic groups’ aspirations for independence from the Indonesian state in the decades after the Second World War, which were fiercely struck back by the Indonesian military, this language nevertheless ultimately created a sense of communality and of belonging to the Indonesian nation-state. Je confirme! About the Dutch answering in English. Thanks for sharing Elise. May I add another layer of reflection? You write: “As English has become the lingua franca in academia…” The assumption is widespread, but is this really the case? In which academia is English actually the lingua franca? In international seminars and conferences in Latin America and Southern Europe (Italy, Spain, Portugal), a whole set of languages are used (Spanish, Portuguese, French, Italian), while English is sometimes not used. Scholarly meetings in Germany are regularly held in German, including when non-German German speakers and non-German speakers are involved. The same is true in France. I am limiting myself to Western Europe and countries with Western European languages as the language spoken by the majority of the population. Is English the lingua franca in Chinese or Russian academia? At a seminar in Moscow a couple of years ago, participants came from five countries and French was the lingua franca. And we both know colleagues who translate from Persian to Turkish, while also mastering Western European languages. I think this issue is very important, because it goes much beyond language as such. The “English-speaking academia” today, with all its internal differentiations, implies specific narrative standards, a determinate type of organization of the historian’s work, and a certain (implicit or explicit) epistemology of history and of the “craft of the historian”. Among others, it means publishing preferably in certain journals, writing with a social-science (rather than humanistic) style, and getting research funds from certain national and international agencies. All these aspects are considerably different in academic environments where other languages (and academic cultures) predominate. I guess we are well aware of the historical and present reasons why the Anglophone model has a hegemonic tendency, and why it sees itself often as the standard. And I am sure we are open-minded enough to acknowledge that the Anglophone “model” is not necessarily the best. I am not calling here for a mere “protectionist” defense of “national” academia (whatever the nation and the language) against English-speaking academia. Indeed, I don’t see how “proper nationalism” might differ from “improper nationalism”. Of course, conflating “internationalization” with teaching and publishing in English is ridiculous. But the other academic models have their pros and cons too, and imposing one such model, and one language, on an “imagined” national community is equally problematic. Conversely, I am arguing for full recognition of the multiplicity of cultures and languages in academia, and for hybridity in academia. I stand for open discussion on, and across, different academic cultures; for the use of multiple languages in conferences, teaching and research; and for multi-directional translations of articles, manuscripts and sources. Above all, I would like academia to become less competitive and more collaborative; less elitist and discriminating, and more open to women and to individuals with different ethnic and social backgrounds. Academia should also be ready to acknowledge its boundaries, and enhance collaboration beyond them: indeed, historical knowledge is not the exclusive property of academics. Possibly, the “politics of language” is about this too.